Lance Cpl. 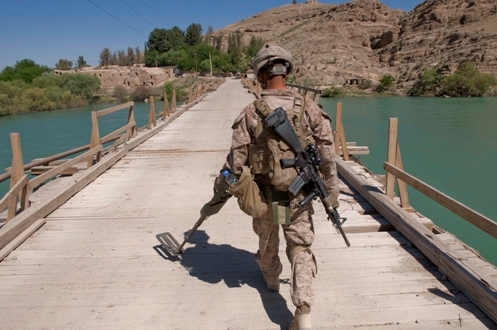 Edward Flores walks point sweeping the Tangye bridge with a Combat Mine Detector as Marines from 2nd Squad, 2nd Platoon, Alpha Co., 1/8 Marines go a a joint patrol with members of Afghan National Army (ANA). The bridge, a primary Helmand River crossing has deteriorated to the point that vehicle crossings are limited. FOB Zeebrugge in Kajaki, Afghanistan on April 11, 2012.